Whatever the production meant of its tagline “New year, the same fight, new hope”, out of curiosity, I piled up among young audience who mainly filled the seats of SM North Cinema in January 8, 2011 to catch the opening salvo of Philippine Stagers Foundation for the New Year with a replay, now on its third year, of Ako si Ninoy the Musical. The production boasts of having hoarded Aliw Awards and had the longest run of 300 shows and counting for a single play in the Philippines. I wondered how the play would present a historical icon nonetheless related to the current President Benigno Noynoy Aquino Jr. and how the audience would respond to its plots and resolution. Ninoy Aquino was a Ferdinand Marcos contender. Among others, attributed to him is the famous line, “The Filipinos are worth dying for”. He was assassinated in 1983 at the height of people’s resistance against Marcos’s martial rule and was a rallying point for the 1986 people power uprising. While there is a conspiracy theory that more than the Marcoses or the CIA, another from the Cojuangco camp is responsible in Ninoy’s killing, this was not the point of the play, neither the life of the Filipino people after Marcos. 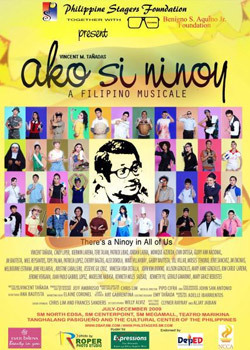 According to the musical, Ninoy experienced sometime in his life, the issues that haunts these ordinary people being himself a struggling student, a budding journalist, a politician calling for change and a family man to Cory, Kris, Noynoy, etc. Here, “ordinary” is categorized as people from below and in poverty line and those in the low to high middle class. Anyone can do heroic acts in our own way. Anyone can be a modern-day hero. These are clichés. The play was successful though in its parallelism of Ninoy to people of different walks of life but this pluralist take can be quite misleading. Did the play intend to tolerate individual action for social change or did it call for collective action? Did it intend to declare that Ninoy’s heroism is relative to martyrs of national democratic movement such as of Quentin who was tortured, accused of being a communist and killed for merely asking about land, food and rights? Was the production aware that Ninoy’s song of epiphany in the prison cell was already an overkill? The musical ran for more than an hour of Filipino humor, simple language, pop songs, eventful encounters and a child’s ingenuity. In the end however, or I should say rather my play-ending syndrome, was a Cory flashed in the line-up of hero characters. I think this was overstretching the scene when Ninoy and Quentin were shut and declared in chorus by the cast as heroes. The production should have been careful given that Cory by the way, had bloody debts among peasants in the Mendiola Massacre, peasants who were disenchanted by her Comprehensive Agrarian Reform Program. I was afraid Noynoy’s face will be flashed. I was happy somehow it wasn’t. Or else, the play is no different to Gloria Arroyo Macapagal’s style of beautifying her name through heroic association in flashing a world boxing champion and a Ms. Universe in her state of the nation address. This entry was posted in Rebyu, Teatro and tagged batas militar, CARP, Cory, EDSA 1, GMA, human rights, karapatang pantao, Marcos, martial law, mendiola massacre, migrant worker, migrante, musical, Ninoy, Philippine Stagers, Pnoy, Pres. Gloria Macapagal Arroyo, Pres. Noynoy Aquino. Bookmark the permalink.